Amazon Freetime Unlimited gives your kid unlimited access to more than 10,000 age-appropriate books, movies and TV shows with characters from Disney, PBS Kids, Nickelodeon and Nick Jr., Marvel and some Amazon Originals. Parents have access to a dashboard that lets them see what their children are reading and watching for the past 90 days and can set limits on the app. This system first debuted on the Fire Tablet in 2012 and it came to Android last year. Amazon announced today that Freetime Unlimited is now available as a standalone app for iOS. There may be variations based on geographies, but in the US the content will include films like Frozen, Moana, Star Wars, and Inside Out; TV shows like Sesame Street, Arthur, and Daniel Tiger’s Neighborhood from PBS; Bubble Guppies, Team Umizoomi, and Dora the Explorer from Nickelodeon; Marvel comics including Spider-man, the Avengers, and Captain America; and Amazon Originals such as Just Add Magic, The Kicks, Thunderbirds are Go, Creative Galaxy, and Tumble Leaf. 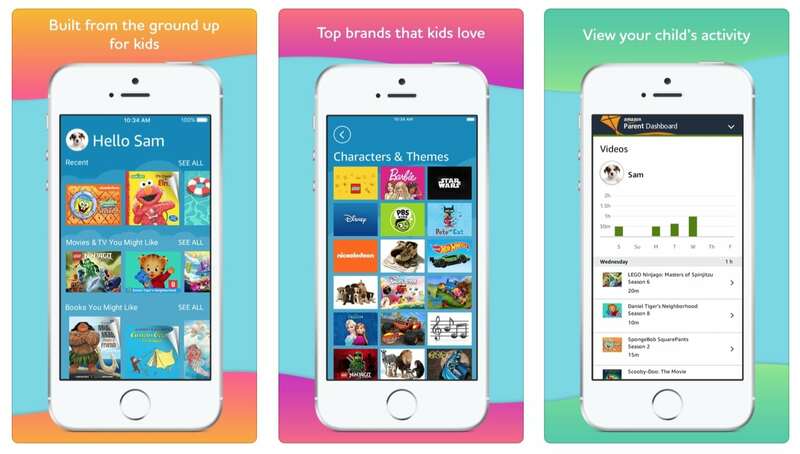 Many companies are starting to focus on apps aimed at kids. Youtube Kids is proving to be one of the most popular. Videos are available in four categories: Shows, Music, Learning and Explore. Youtube also took out the complicated stuff to make an app even little ones can navigate — that means big buttons, easy scrolling, and instant full-screen. Kids can enjoy favorites like Sesame Street, Thomas & Friends and Talking Tom, online hits like Mother Goose Club, TuTiTu and Stampylonghead, plus anything else they’re into — sports, animals, gaming, crafts and more. Facebook also launched a dedicated Kids Messenger app last year. Messenger Kids is full of features for kids to connect with the people they love. Once their account is set up by a parent, kids can start a one-on-one or group video chat with parent-approved contacts. The home screen shows them at a glance who they are approved to talk to, and when those contacts are online. You can subscribe to Amazon Freetime directly within the app on your iPhone and iPad. It goes through the Apple subscription system. There is also a free 30-day trial.